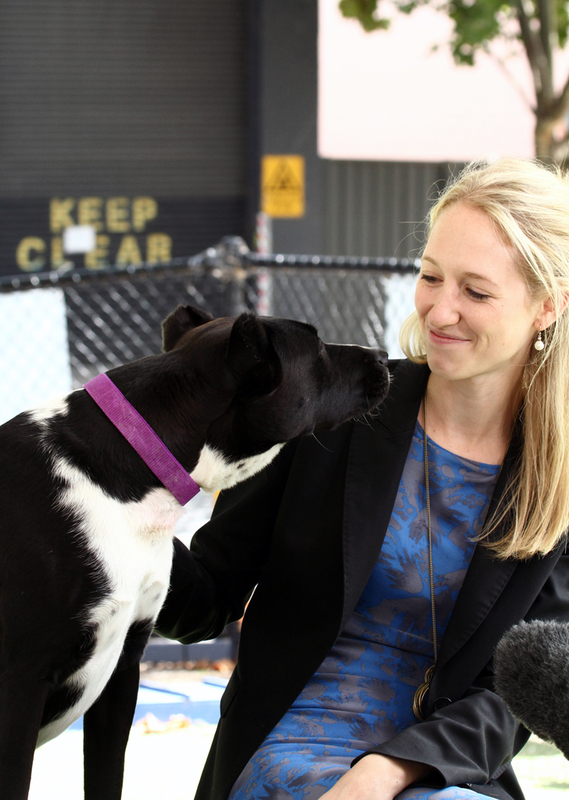 Almost three years after our most famous former resident, Buckley, was brought into The Lost Dogs’ Home with devastating injuries to his ears and tail, he returned to the North Melbourne shelter today with owner Madeline for a quick catch-up and a cuddle with staff. It’s almost hard to recognise the little pup that stole the hearts of millions around Australia and the world in 2009. Back then a tiny slip of a dog, with mangled ears and a hacked-off tail – the result of a sick and senseless attack – today, Buckley weighs in at 27kg, has neat (if a little odd-looking) ears and a little stump of a tail, which he attempts to wag often, especially when looking up at Madeline. “I can’t believe we’ve had nearly three years together; it feels like only yesterday I got the call to say he would be coming home with me,” Madeline said. The Home received over 350 applications to adopt Buckley back in 2009, but after many interviews, it was decided that Madeline would be the lucky one to take him home. When asked if she still feels as lucky today, she grinned and looked over at Buckley, who was enthusiastically chewing on a stuffed toy monkey. By now very accustomed to a camera in his face – Buckley’s attack made international news at the time – Buckley happily played up to the Channel 7 camera crew, who visited the Home to capture the reunion today. Madeline said she is surprised and touched that people are still interested in Buckley’s progress. Operations Manager for the Home, and Buckley’s former foster carer, Jodie Addamo said she is so relieved how everything has worked out for the Home’s informal mascot. “You see a lot of things in this job but what happened to Buckley … you just don’t forget stuff like that,” she said. “However you look at him today and see how happy and healthy he is… it’s almost hard to put the two images together. As for Madeline, she said it hasn’t always been easy being the owner of one of Melbourne’s most famous pooches. However she knows that she and Buckley are always welcome to call on the Home for help.